*The photos taken by Jordan Miles’ mother show his face covered with raw, red bruises, his cheek and lip swollen, his right eye swollen shut. A bald spot mars the long black dreadlocks where the 18-year-old violist says police tore them from his head. For MORE of this story via the Associated Press, go HERE. Profiled by already racist cops! I don’t know why they have yet to figure out how to weed out those that have problems with other races and even paying out on lawsuits hasn’t seem to deter these crimes. I hope this woman does sue. damn!! they wore his a/s/s out!!! damn!!! WTF?? I don’t know what else to say. This is awful. Black mothers need to tell their black boys that they need to know their rights and how to conduct themselves when they are approached by the cops. Always cooperate and don’t make any sudden ‘moves’ or risk getting your a$$ beat or worst, be killed. The picture above is horrible but at least, he’s alive. I hope he and his mother sue the hell out of those pittsburgh cops. That is just ridiculous. I hope his mother files a lawsuit against the city of Pittsburgh and its police department. 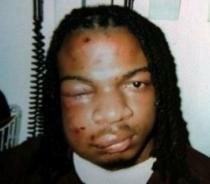 This young boy was racially profiled and severely beaten just for being black. Now he’s psychologically traumatized because of some overzealous cops — damn shame. If America was as civilized a society as they would have the world believe, there would be protocols to compel an officer to restrain suspects and cuff them before resorting to this type of barbarism. And Violation of said protocols would carry serious consequences. I’m not an advocate of Tasers, but why didn’t they tase him, if he did in fact pose a threat? The only reason three grown yt men, who are employed to enforce the law in a supposedly law abiding society, would do something like this to a 18 year old kid, is because they don’t view us as citizens worthy of any of the protection afforded by their laws. We are the others, outsiders, like how they view the Iraqis. Hadjis, as they call them. Some Arab to be exploited as they steal their land and oil. But there is one important difference. Yt people tried that shyt over there, and they not afraid to fight for their people survival and self esteem. So far, over four thousand of them got sent back home in body bags. They went to Afghanistan and the same shyt happen. We the only people that yt people feel free to abuse like this. But they been doing it for over four hundred years. Old habits die hard. This kinda stuff really breaks my heart. DAMMMMN! They beat homey asian!